I'm so excited--my good friend Danette Hansen is publishing her first book November 20. A historical mystery called COINCIDENCE. 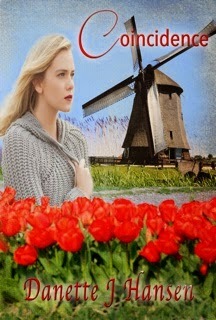 Annaliese VanLuyk soon discovers there's more than a hidden doily dating to World War II in this old Dutch house. It also contains a family mystery and she’s the only one who can solve it. Unfortunately this isn’t how her time in Netherlands is supposed to be spent. She’s here to be involved in the Plant Research Program at Wageningen University. With so much of her attention and energy being divided between her new friend, Nigel and solving this mystery, her stay in Holland could come to an end along with her career she’s always wanted. The lamp tumbled to the floor. “No!” I threw my arms out to try to catch it, but I was too late. Glancing back at the mess on the floor, I noticed a strange doily was tucked inside the lip of the vase lid. I pulled it out gently. Ribbon, on a doily? The left corner was burned, and the thin ribbon was sewed on one side. I held the bumpy fabric in my hands. How odd. Why would anyone stuff this in the lid of a vase? You can preorder Coincidence on Amazon HERE!!! And in celebration of her upcoming debut, Danette is giving away a $20 Amazon Giftcard. Click here to enter now! so I guess it’s fitting that I now give names to characters in stories. The problem now is I have too many ideas and not enough time in the day. I’m a mother of four beautiful children, who are growing up much too fast. I’m married to the best guy in the world! We live in Northern Utah nestled in the mountain side. I believe there are magical moments in life––and if there isn’t for a time, then that’s when you wish for magic.